Last year, the Brooklyn Law Library added to its collection The Lawyer’s Guide to Writing Well (3d ed.) by Tom Goldstein and Jethro K. Lieberman (Call No. KF250. G65 2016). This critically acclaimed book “should be in the office of every lawyer” says William Safire of the New York Times. 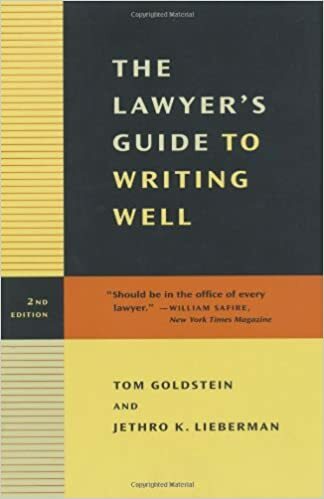 In its 286 pages, the authors demystify legal writing, outline the causes and consequences of poor writing, and prescribe easy-to-apply remedies to improve it. Reflecting changes in law practice over the past decade, this revised edition includes new sections around communicating digitally, getting to the point, and writing persuasively. It also provides an editing checklist, editing exercises with a suggested revision key, usage notes that address common errors, and reference works to further aid your writing. This guide is an invaluable tool for practicing lawyers and law students. Chapters are: Why Lawyers Write Poorly — Does bad writing really matter? — Don’t make it like it was — The Practice of Writing — Ten steps to writing it down — Of dawdlers and scrawlers, pacers and plungers: getting started and overcoming blocks — The technology of getting it down: from quill pens to computers — Lawyers as publishers: words are your product — Getting to the Point — Writing persuasively for your audience: tell your audience the point — Writing the lead — Revising for Clarity and Luster — Form, structure, and organization — Wrong words, long sentences, and other mister meaners — Revising your prose — Making your writing memorable. Written by: Harold O'Grady on January 28, 2017. This entry was posted in Book Review, E-Resource, Legal Writing, SARA Catalog on January 28, 2017 by Harold O'Grady.